DALLAS – Award-winning North Texas’ Irish folk band The Selkie Girls will celebrate the release of their third CD, Pirate Queen, on October 2 at The Celt in McKinney. Two years in the making, Pirate Queen is a rich blend of Celtic ballads, upbeat jigs, contemporary Irish music and even a bit of Celtic rock. The band’s rich two- and three-part harmonies layer upon traditional Celtic instruments including flutes and penny whistles, harp and even the rare octave mandolin. A theme album of songs exploring the role of women in Ireland and Scotland, Pirate Queen includes a Gaelic rebel song, “Oro Se Do Bheatha Bhaille” which celebrates Grace O’Malley, the first female chieftain of the Irish O’Malley Clan and known as the original Pirate Queen. The album also includes an upbeat balled inspired by Princess Louise, a true British royal who was beloved by the Scots and called the “Queen of Argyll.” The CD includes songs sung in English, Scottish Gaelic and even in Broad Scotts -- English with an overlay of Scottish Brogue. The Pirate Queen CD cover and liner notes are filled with beautiful original art in pen and watercolor by award-winning North Texas artist Ann Huey. Limited run posters of the Pirate Queen artwork are also available from the band. On St. Patrick’s Day 2016, The Selkie Girls “Gaelic Song” won the Celtic Radio Music Award for “Best Song of 2015” in the Roots Traditional music category, earning the single a place in the Celtic Radio Hall of Fame. This fan-based award was another example of the Selkie Girls’ growing popularity. The Selkie Girls were also voted one of the Top Twenty Best Celtic Folk Bands of 2014 by Marc Gunn's Irish and Celtic Music Podcasts. Formed in Coppell, Texas five years ago, The Selkie Girls include Allison Johnson (guitar, lead vocals), Jaycie Skidmore (penny whistles, flutes, lead vocals), David Ervin (guitar, mandolin, octave, vocals), Joel Black (upright, acoustic bass, vocals), Martin McCall (percussion, drums), and Linda Mudd (harp). 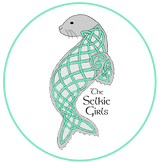 The band is named for selkies, mythological creatures from Scottish and Irish folklore. As the legend goes, selkies are thought to be seals that shed their skin to become human on land. Their debut album, The Parting Glass, has been well-received both critically and commercially, with the title track garnering international attention. Their sophomore album, Long Time Traveling, expanded the group’s sound with more intricate arrangements, further pushing the envelope of contemporary Celtic music. Both albums have received rave reviews (from fans and press alike) and have been selling steadily at live shows and online via iTunes and Amazon, with numerous tracks receiving airplay on stations throughout the world. www.theselkiegirls.com. The Selkie Girls have performed at the most sought-after events throughout the state, with featured performances at the North Texas Irish Festival, Austin Celtic Festival, Texas Scottish Festival, the Kimbell Art Museum, and some premier local pubs as well. For more information on The Selkie Girls or to hear audio clips of their music, visit their website at www.theselkiegirls.com. Or visit iTunes to hear songs from Pirate Queen at https://itunes.apple.com/us/album/pirate-queen/id1153884653.